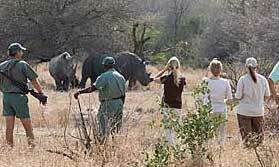 In their 12,000 hectare Kruger private concession area, Rhino Walking Safaris operates Rhino Post Safari Lodge, Plains Camp and also have a Sleep Out platform. Plains Camp has just four luxury tents in the 'old pioneer' style, rustic yet very comfortable indeed. There is an en-suite bathroom with flush loo and hot shower. There is also a dining room and lounge and a campfire area. The camp looks out onto a wide plain where many superb wildlife sightings are often experienced. The camp is ideal for anyone wanting a more remote camp from which to enjoy game walks. Walks of about 3-4 hours are usually taken in the cool of the mornings, then in the afternoons you are driven to a different area for a shorter walk. After sundowners you take a night drive back to camp. The Sleep Out platform is yet another experience which Rhino Walking Safaris offers, and this is for anyone who wants to get closer to the wilderness. The elevated wooden platform has mozzie nets with sleeping bags, and there are flushing loos and a small kitchen area. You could have a night here and then walk back to Plains Camp. Open: Rhino Plains Camp is open all year. Location: Rhino Post is in a private concession of 12,000 acres bordering the Mala Mala and Sabi sand reserves in Kruger. It is in a grove of Acacia trees overlooking the Timbitene plain and waterhole. The camp is about a 45 minute drive from Skukuza airport. Rooms: There are 4 explorer-style tents with en-suite shower rooms with hot and cold running water. Activities: This is a base for walking safaris. A typical day starts with an wakeup call and cup of tea or coffee and snack, then you set out for the first walk of the day. The duration of the walk will depend to some extent on the fitness and interest of the guests, but is usually between 3 and 4 hours. You will return to the camp for brunch and time to relax or have a siesta. After high tea you will set off for the later afternoon walk or game drive, followed by sundowner drinks. You will have dinner back at the camp. Facilities: There is a communal lounge and dining area with an outside fireplace. Children: There is a minimum age of 12 for the walking safaris. Sleep Outs: The camp also offers the option to sleep out on a raised platforms with proper beds, mosquito nets and fly sheets if needed. You leave plains camp in the late afternoon and arrive at the platform in the early evening, taking a daypack with a change of clothes and refreshments. You have sundowners overlooking the waterhole. You can sit around the campfire as dinner is prepared, listening to the sounds of the animals around you, safety guarded by observant guides. After your night in the wilderness, you wake to a snack breakfast and return to Plains Camp for a hearty brunch. Please note that the sleep outs are highly dependent on weather conditions and requires a minimum of 4 people to operate.